With the steady increase of building permits pulled in Scottsdale Az, Signature Iron Doors has seen a huge increase in our cliental from Scottsdale. Located just in Phoenix Arizona, new builders and home remodelers have sought out Signature Iron Doors for all their iron work needs because they know the timeless quality of our product. 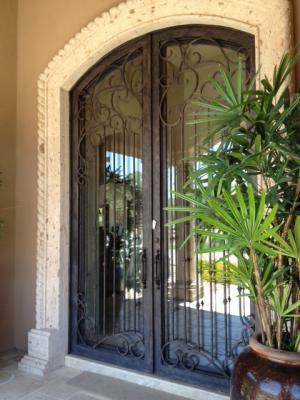 These are a couple of doors we’ve done recently for Scottsdale Arizona customers. All our iron is hand forged with 14 gauge steel. 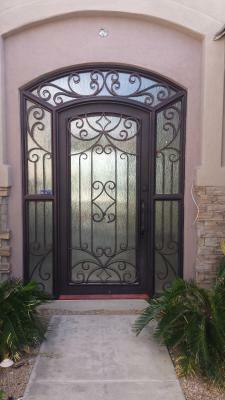 You can either custom design your door or choose from our array of designs. We keep a full inventory of our most popular designs so that if you are in a bind and need a door immediately, we can have one ready to be installed in your home immediately. We thoroughly enjoy our relationship with homeowners and builders alike and helping you reach your home design goals. Although, without a doubt our iron doors are exquisite to see, their roller catch and operable glass make them easy to function in addition to their timeless quality. Signature Iron Doors will bring the piece of grand elegance you’re seeking for your home. Call us and come visit our showroom in Phoenix Arizona to meet with our sales team and to find out how Signature Iron Doors can help complete your new home vision.